Christmas is a time of family get-togethers, long car rides and gratitude for gifts received. So more often than not, the less said during Christmas time, the better. With this platitude in mind, let’s turn our attention to Merry Christmas, Mr. Bean, a 26-minute short starring an actor who says almost nothing at all. Rowan Atkinson’s Mr. Bean appeared in 14 episodes of British television between 1990 and 1995. The character was always the same: a fumbling man-child in a cheap suit, wandering through a regular world without bothering to adapt to it. He’s capable of kindness, but is more often selfish, in part because of that inadaptability of his. Sometimes, he’s just a jerk. Most important, though, is that Bean almost never speaks. He usually grunts and hums to himself and his answers, when he's addressed, are mono-syllabic. He is a silent character and Atkinson, in this role at least, belongs to the same tradition as Charlie Chaplin, Buster Keaton and Harold Lloyd. But you know who Bean’s really like? Harry Langdon. Langdon’s not so well-known today, but he was a big deal, once. Possessing none of Chaplin's or Keaton’s acrobatic skill, Langdon relied instead on his facial expressions (usually variations on bewilderment) and a stock character of particular weirdness. Like Bean, this character was a social misfit; an overgrown baby. Like Bean, he could be cruel, though his misdeeds were rooted in a basic misunderstanding of the world around him. 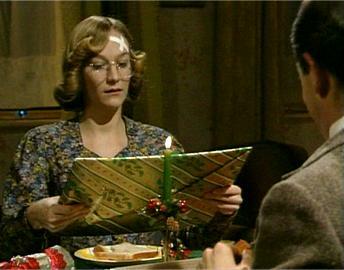 The opening act in Merry Christmas, Mr. Bean could easily have starred Langdon. Bean is seen wandering Harrods department store, looking for decorations. He cannot decide between two tree bulbs. Holding a bulb in each hand, he drops the first, which bounces off the floor. The second one he drops, shatters. So he takes the first one, which is clearly the better product. The acts ends when Bean finds a nativity scene—with moveable figures!—in the toy department. The Holy Family is soon threatened by a Tyrannosaurus rex, a mobile battlesuit from Dr. Who, and other assorted anachronisms. A plastic helicopter saves the day. Neither Bean nor anyone else speaks a word in this first act, though Atkinson does provide several sound effects for the animals, vehicles and robots he pits against the baby Jesus. Act Two is set outside. While scouting a Christmas tree (not one for sale), and inadvertently conducting a Salvation Army brass quartet, Bean runs into his girlfriend, Irma Gobb (Matilda Ziegler). Irma has poor taste in men and evidently, very few options; even so, she’s losing patience with Bean. She motions him to a jewellery store and points (jabs the glass, really) at a picture of a huge wedding ring. Then she departs. Irma’s thrilled when she turns back for a moment and sees Bean entering the store. Act Three finds Bean returned to his flat, where he prepares himself and Teddy (a stuffed bear, naturally) for Santa’s arrival. He hangs three stockings (one for each of them, plus the mouse), then settles in for a glass of wine and a little TV. When the television shows nothing but horror movies, he opens his apartment door, turns around his chair and watches a group of child carollers instead. When they’re done, he slams the door in their faces, just as he’d have switched off the tube. Bean, clearly, cannot tell the difference. Besides being a nasty good joke, this sequence recalls various Chaplin gags, in which the Tramp would duplicate the amenities of the wealthy with whatever materials he had at-hand. As Chaplin might recreate the luxury of a spaghetti dinner with shoelaces, so does Bean enjoy a Christmas special through his door, rather than on his screen. Act Four pulls it all together. It is Christmas morning and Santa has come through, bringing new eyes for Teddy, and for Bean, a mate for the sock he already hung. Irma is about to arrive for a quiet dinner and before she does, Bean must stuff, then roast, an enormous turkey. The director places the camera in front of Atkinson, who positions himself behind the carcass like an obstetrician, and reaches in. When he loses his watch, he has to dig deeper. When Irma rings the doorbell, he gets the bird stuck on his head. This joke offers a great lesson about silent comedy, in that it’s an exception that proves a rule. Silent comedy is not, for the most part, delivered by people who cannot speak. Early-20th century silent comedians were seen to speak all the time; technology simply didn’t allow them to be heard. So, they developed a form of comedy, rooted in vaudeville and the British music hall, which did not require sound to be funny. Audiences of the period would have heard lots of sounds, of course; not only the accompaniment of a pianist, organist or orchestra, but perhaps a live narrator. Some of Bean’s animal sound-effects in Act One could have been easily reproduced by the versatile Mighty Wurlitzer. Key to this is that no sound effect, tune or word can be the basis for a major gag or turn of plot. Bean mumbles and murmurs a lot in Merry Christmas, Mr. Bean, especially in Act Four, but none of what he says matters much. It is just for colour. Only Irma actually says something that makes us laugh. While there are other, minor moments of speech in the fourth act, leading to a brilliant pay-off for the wedding ring gag set up in Act Two, the rest of Bean and Irma’s meal is executed with physical comedy alone.